The snow is falling on Mackinac Island and we are getting ready for the 2018 Christmas Bazaar ! We have raffles , crafts , Christmas tree lighting and caroling , artwork , one of a kind experiences , speciality Christmas Trees , gift certificates , bake sale, music , food , drink and now we have a Christmas Play ! Call now to get your hotel reservation . It will be a Once in a lifetime Mackinac Island Experience. October 15, 2018 Update: This year we have a play for you : “Behind The Pageant” put on by the Community Arts Council and local members of our Community theatre group both young and old . The play will be held at the Mission Point Theater after the auction. The cost will be by donation. We have specially decorated Small Christmas Trees to be auctioned off as well as many new and old fan favorites for our live and silent Auction ..
Snowmobile Raffle tickets for sale : $2 each for a chance to win a 2018 Ski Doo Grand Touring LE 900 Ace Two Up . New kids activities, as well as a few new items such as our Mackinac Island Christmas Bazaar tote bag and more. Information below is from Mackinac Island Christmas Bazaar 2017. Look for updates for 2018 soon. This annual event is a fundraiser for the Mackinac Island Medical Center, St. Anne’s Catholic Church, Little Stone Church, Trinity Episcopal Church and the Mackinac Island Bible Church. The Annual Christmas Tree Lighting (December 1) kicks the weekend off with caroling and good cheer. Gather at 5:00 pm across from the Star Line Dock #1. The Rummage sale then opens for early birds to get first dibs on the best buys in the Mackinac Island Fire Hall. Hot Cocoa and cookies are available! We are very excited to announce that we have added a new event to the Mackinac Island Christmas Bazaar!! Friday evening after the tree lighting (approximately 5:50 to 6:30 ish) there will be a Pig Roast dinner offered in the courtyard of the Community Hall, behind the Stuart House Museum. Pork roast, beans and cornbread, and drinks will be available. Cost? On Donation!! Please remember that proceeds benefit the Medical Center and 4 churches on the Island. Thanks so much to Andrew Doud and Doud’s Market for sponsoring this great event! The Festival of Trees is a new addition for 2017. Area businesses and groups are decorating 18″ Christmas Tree Centerpieces that are auctioned throughout the weekend. A 2017 Ski Doo Expedition Sport 900 Ace Two Up snowmobile is the grand prize for the annual raffle. Tickets are $2 each. On Saturday, the Community Hall and Fire Barn open at 11:00 a.m. Lunch is served in the Community Hall at 11:30 and throughout the day! Santa arrives at 1:30 p.m. and kid’s activities are at 3:00 p.m. The live auction begins at 2:00 p.m. Activities for the day will be completed by 6:00 p.m.
On Sunday, The Community Hall and Fire Hall open again at 11:00. Lunch is a Prime Rib Dinner starting at 12:00 p.m. Kid’s games start at 3:00 p.m. at Trinity Church, sponsored by the Mackinac Island Arts Council. The live auction starts at 2:00 p.m. Activities for the day are completed by 6:00 p.m.
On Monday, doors open at 11:00 with lunch at 11:30 a.m. The raffles are drawn between 2:30 p.m. and 3:00 p.m.
Lilac Tree Suites and Spa is open on November 30th and the 1st of December for Mackinac’s Christmas Bazaar Weekend! Below are the latest postings from the Mackinac Island Christmas Bazaar Page On Facebook. 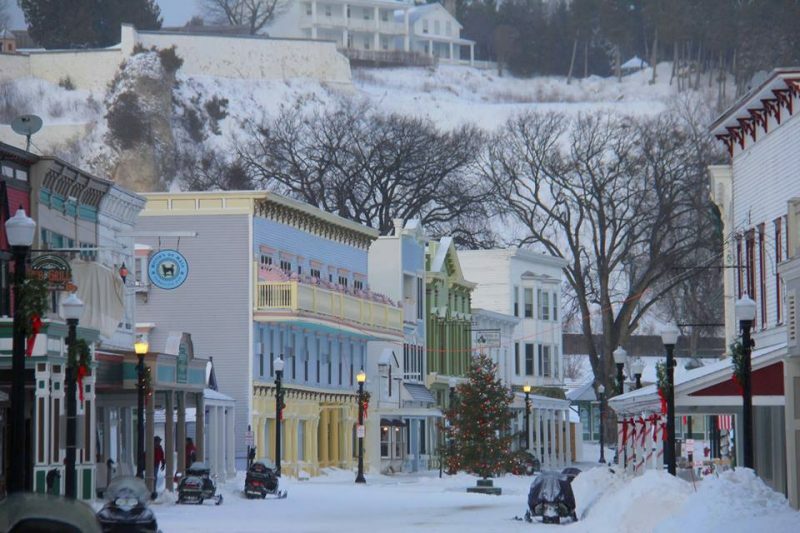 Mackinac Island Christmas Bazaar shared a post. The people have spoken .. The snow is falling this morning and the prime rib dinner is cooking ..